This worked really well the instructions on how to use it are all there and it works. What is important is that you cannot eat this meat right away it must cure for a long time. The nitrates turn into nitrites by bacterial processes. If you eat it right away like bacon you are DEAD! Slowly the meat drys and cures until is it not raw but cured and tastes good. 2) Rub the meat with half of the cure mixture, if using a boned joint ensure that the inner surface of the meat is properly coated, massage the cure into any crevices. I suggest you try a couple of kg of meat to start with. I did a piece with skin on from a leg but a loin works really well as it is so tender. 6) Leave the meat to cure for another 15 days. 7) Unwrap the meat and leave to soak in tepid water for half an hour. 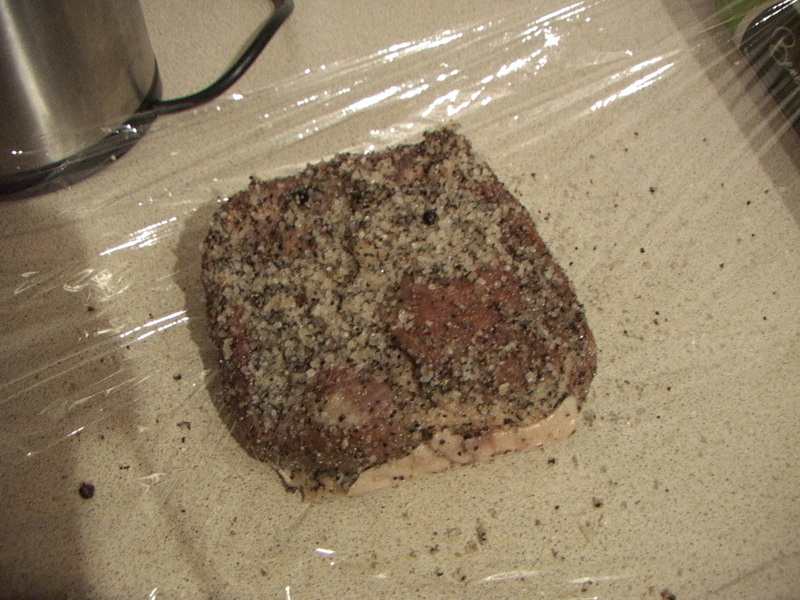 9) Smear the meat side of the ham with a mixture of lard and black pepper. Hang the ham in a warm room for 3 days, (an airing cupboard is ideal). Best to warm lard before it goes on, use a bag over your hand and seal any cracks. I hang in fishnet stocking large open weave. 10) Hang the ham for a minimum of 30 days at 15 degrees Celsius with a 70% relative humidity. Try and make sure the place you hand is dark, cool, medium humidity. Any extremes and will not work. You can wrap it in muslin as well to try and stop drying out too much. Also you can take off the skin first as it becomes very very hard, really depends on how the meat is cut to the benefit. If you are doing belly pork this way then reduce drying time and remove before curing.